We the People: An Introduction to American Politics | Free eBooks Download - EBOOKEE! Posted on 2013-01-08. By anonymous. 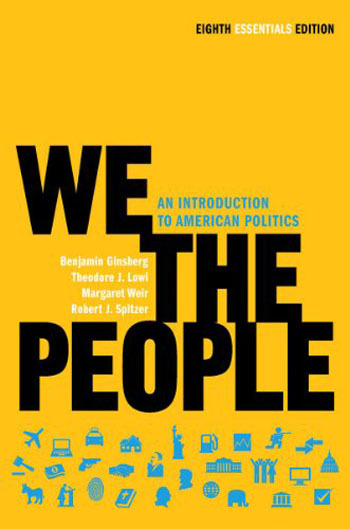 Benjamin Ginsberg, Theodore J. Lowi , "We the People: An Introduction to American Politics"
Based on the market-leading full-length text, We the People, Essentials Edition, offers authoritative treatment of the core topics in American politics. Key features from the full editionï¿½such as the ï¿½What Government Does and Why It Mattersï¿½ chapter introductions and ï¿½Get Involvedï¿½ boxesï¿½offer a proven way to highlight relevance and participation within a more streamlined pedagogical program. In the Essentials Eighth Edition an innovative new design and expanded review materials help students engage and succeed in the course. No comments for "We the People: An Introduction to American Politics".